Bia Bright practices her kicking technique with Taekyung Lee Wednesday. 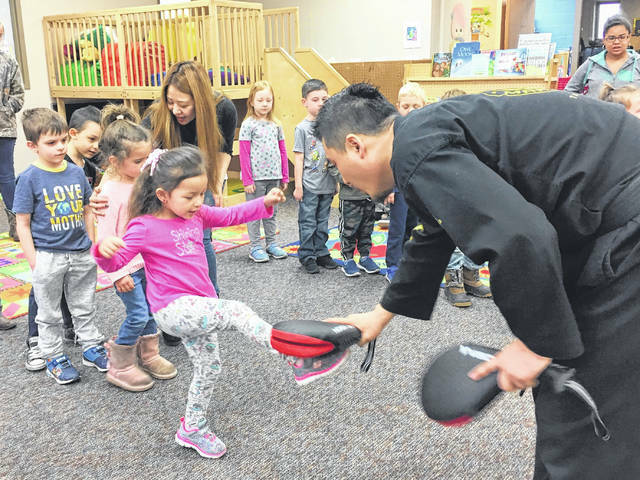 Seniors in the Delaware Area Career Center’s Early Childhood Education program partnered with Tiger Lee Martial Arts to bring a health and wellness lesson to preschool students. High school students studying early childhood education at DACC are part of a team that runs a preschool, creating curriculum and activities for their preschool students. World Taekwondo Federation (Olympic-style) Certified Master – 5th Degree Black Belt Master Taekyung Lee, volunteered to lead the class through a series of exercises and techniques in order to add to the variety of activities the children are learning. Additional activities in the health and wellness series include a lesson in hip hop dancing from DACC Intervention Specialist Alyssa Fickert, and a trip to the Delaware YMCA. Information in this story was provided by the Delaware Area Career Center.